A well organised store cupboard and freezer will mean that you can always lay your hands on the right ingredients and know what food you have to feed a hungry family. Food has to be stored correctly or it will perish before you have time to use it. With the right containers food will stay fresh and ready to use without becoming contaminated or unusable. Check the use by dates on all food that is stored whether it is in your cupboard, fridge or freezer. When decanting food down into other containers not only label so you know what the contents are but also write the use by date as well otherwise you could be eating food that is two years old! 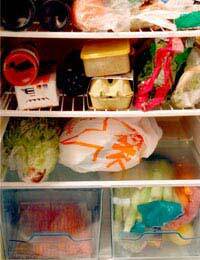 Make sure when freezing or storing food in plastic bags that you are using the right type of bag. Some bags are only supposed to be used to carry food such as sandwiches and not be used in the freezer. Purchase bags that can be written on so that you can identify the food within. It is surprising how once food is frozen we can forget what we have stored in our freezers. Some food such as ice cream and frozen vegetables come in containers or bags that can be used in your freezer. Make sure that once the safety seal on ice cream containers is open that the lid still has a secure seal or your vanilla ice cream will soon taste of onion, peppers or other highly flavoured foods stored alongside. Once you have opened a bag of peas or other vegetables use a twisty tie or peg to keep the opening securely closed. However hard we try it is so annoying to find stray peas in the bottom of the freezer along with sweet corn and a stray profiterole when we come to defrost the appliance. If you like to hoard large quantities of canned tomatoes and baked beans keep the older tins to the front and use them first. It is so easy to let things go to the back of a cupboard and forget about them until they are too old to use. Plastic containers are so cheap to buy. Do not be tempted to hold onto containers once they have been through your dishwasher one too many times. The lids tend to buckle and lose their seal .Dispose of them before you end up with gravy frozen to the sides of your freezer where it has leaked out. If you are keeping meat left over from a roast make sure that it is cool before placing in the freezer. Keep it covered while cooling and as soon as it is cold either cover with cling film or pack into a clean plastic container. Never place warm food into the freezer as it can defrost other food already stored there. Check that your fridge or freezer is at the right temperature for storing food. Most appliances have directions for this inside the door or on view. If not refer to the instruction book. Use a thermometer if you are unsure of how to follow the temperature dials on your fridge or freezer. By making sure that your foodstuff is kept in airtight containers it will not become contaminated by rodents and flies and bugs. These can lay eggs in items such as flour and pasta and it is easy to use these items without realising that they are contaminated. If in doubt throw the food away but rather than waste food store it in a suitable container on the day you purchase it.